“The M&M’s were in six different colors. A quick count showed that there were 55 M&M’s: 17 brown, 18 red, 7 yellow, 7 green, 2 blue, and 4 orange [see Figure 1]… The distribution shown in Figure 1 concerns just my one bag of M&M’s. You might be wondering about the distribution of colors for all M&M’s. The manufacturer of M&M’s provides some information about this matter, but they do not tell us exactly how many M&M’s of each color they have ever produced. Instead, they report proportions rather than frequencies. Figure 2 shows these proportions. Since every M&M is one of the six familiar colors, the six proportions shown in the figure add to one. 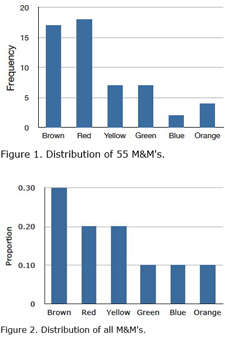 We call Figure 2 a probability distribution because if you choose an M&M at random, the probability of getting, say, a brown M&M is equal to the proportion of M&M’s that are brown (0.30). Examples of probability distributions include Normal Distributions and Power Law and Pareto Distributions. “There are many different classifications of probability distributions. Some of them include the normal distribution, chi square distribution, binomial distribution, and Poisson distribution. The different probability distributions serve different purposes. The binomial distribution, for example, evaluates the probability of an event occurring several times over a given number of trials and given the event’s probability in each trial. The usual example would use a fair coin and figuring the probability of that coin coming up heads in ten straight flips. The Study of Quantitative Methods (core topic) in Quantitative Methods and Atlas104 Quantitative Methods. Investopedia, Probability Distribution, at http://www.investopedia.com/terms/p/probabilitydistribution.asp, accessed 10 June 2017. Page created by: Ian Clark, last modified 10 June 2017. Image: Created from images on OnlineStatBook, at http://onlinestatbook.com/2/introduction/distributions.html, accessed 10 June 2017.